attitudes about torture and the humane treatment of prisoners. (MARTIN) On the way home from his first battle with the Iroquois nation, along the banks of a beautiful lake to which he’d just given his name, Samuel de Champlain should have been savoring his victory and basking in success. But he wasn’t able to for one simple reason: his Algonquin allies were subjecting their prisoners to the most extreme forms of torture. While marching back, Champlain’s allies "harangue" one prisoner with all the evils he has done to their people, and promise to do the same to him. To mock him, they force him to him sing, and "It was a very sad song to hear," Champlain writes in his Voyages. Then the prisoner undergoes a series of tortures too horrible to describe here. Champlain describes the pity he feels for the victim who stoically endures these torments. He tries to get his allies to stop. But they invite him to take part instead. Champlain refuses, saying that torture isn’t customary in his culture. Finally, when the men see Champlain is truly upset, they allow him to use his arquebus for a coup de grâce to end the victim’s suffering. Unfortunately, even then, the ordeal isn’t over. To Champlain’s disgust, the episode ends with forced cannibalism. 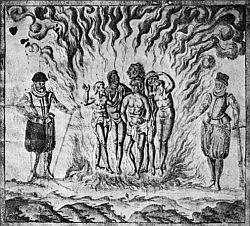 In his writings, Champlain describes other scenes of ritual torture and cannibalism by indigenous peoples, but the first atrocities he witnessed in the New World were by the Spanish. In Champlain’s "Brief Discours" of his travels in the West Indies, he expresses shock at the cruelty of Spanish Inquisition in the New World. He describes, and draws, the Spanish beating Native Americans with clubs for not attending mass and burning them for heresy. He claims the Spanish finally had to relax their strict religious rules – otherwise all of the local Native Americans would have been burned at the stake. All in all, Champlain seems to be less tolerant of the Spanish, who tortured in the name of Christianity, than certain Native American nations, who tortured out of pure revenge against a dreaded enemy. When Michel de Montaigne wrote his essay "On Cannibalism" about 20 years before Champlain’s first visit to New France, he seemed to anticipate Champlain’s thinking when he wrote, "I am not so concerned that we should remark on the barbaric horror of such a deed, but that, while we quite rightly judge their faults, we are blind to our own." He makes the case that we deem acts "barbaric" mostly for their strangeness, and not their inherent cruelty. Citing the horrors of Europe’s religious wars, Montaigne writes that "…it is more barbaric to commit atrocities… not against old enemies but among neighbors and fellow-citizens, and – what is worse – under the pretext of piety and religion." If Champlain were with us today, 400 years later, I think he might be surprised to find our advanced civilization still struggling with the same question: the humane treatment of prisoners. Maybe when it comes to lessons on justice and humanity, we should – like Champlain – try to lead by example. This week, as part of VPR’s special Champlain 400 programming, commentator Mike Martin is looking through the "Eyes of Champlain." On Wednesday, he considers Champlain’s views about the various cultures he encountered in the New World.